- Dmitry Sosnovskiy was scheduled to face Junior Albini at the event. However Sosnovskiy pulled out of the fight in early January after undergoing surgery to correct a recent injury. On January 2, it was announced that Albini will now face promotional newcomer Jairzinho Rozenstruik. I have followed the odds on UFC fights lately and seems like a lot of old school fighters were underdogs for whatever reason - Aldo, Cerrone, and even Holloway was briefly an underdog against Ortega. Aldo won against Stephens, Cerrone against Perry and Hernandez, and Holloway beat Ortega. None of the fights were really competitive. 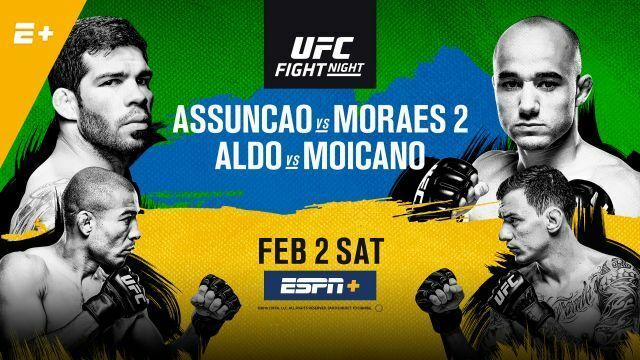 Again, I see Aldo being an underdog, and although I've seen Moicano only in his last fight, I just think that this is a must bet since Moicano is about to face his toughest test. Although Aldo is far from his prime, his skills and experience will likely be too much for Moicano. * Frota fined 40% of her prize purse. ** Bibulatov fined 20% of his prize purse. Good R1 and R2 between Max Griffin and Thiago Alves. Crazy that Alves got the robbery decision win. Great performance by Charles Oliveira! He's still undefeated (15-0) in Brazil. Nice win for Jose Aldo! He is probably lucky the referee stopped the fight early. He probably would've been gassed after that big flurry of punches. That being said, I probably don't care at all about Moraes' win since Aldo's fight was the real main event, but he decided he wanted a 3-round fight instead. imo aldo looked pretty quick in the fight. i have a feeling it's realted to the fight taking place in brazil and his desire to finish his contract with all the remaining fights happening in brazil. I dunno if its the same company that makes the doping tests or if they do it as frequently as they do it in the US but i just have an overall feeling that fights in brazil are more likely to be influenced by drugs than fights in the us (not that it doesnt happen over there btw but it`s a feeling i have). What happens in Brazil, stays in Brazil. I don't mind if fighters are on something, as long as it helps them perform better. He definetly doesn't seem like a great person. But he has the kind of personality that makes me excited to watch him. Its not only about his skills.